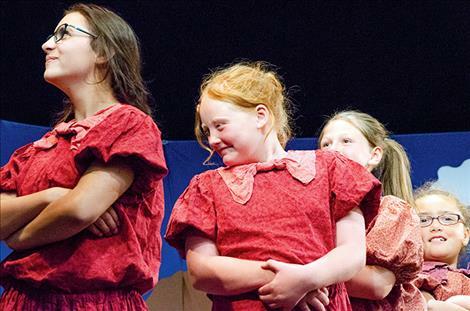 Actors playing roles as the younger daughters set the farm scene on stage. Phoenix Schreckendgust, the younger Beauty Lou, listens to Ethan Buys, the imaginary friend. 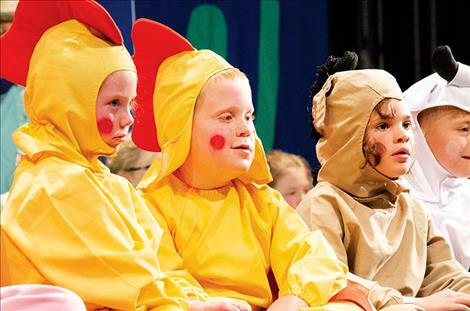 The Barnyard Critters ham it up during the play. 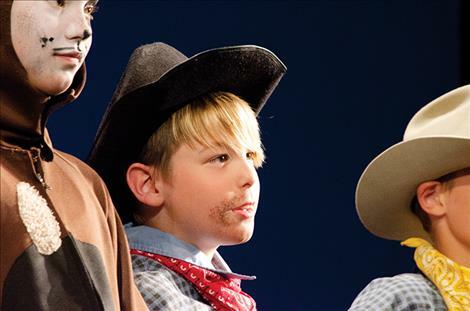 The Country Folk show their excitement about the rodeo performance in the play. The Barnyard Critters take the stage. Nissa Rodda plays Fleabite Clyde. 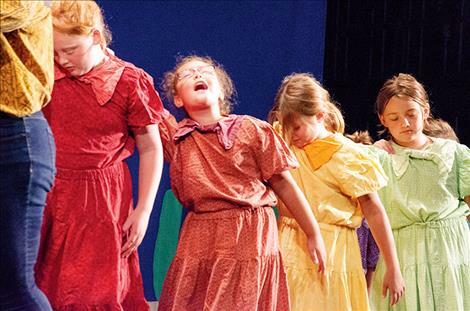 The younger daughters wrap up the play with a final scene. 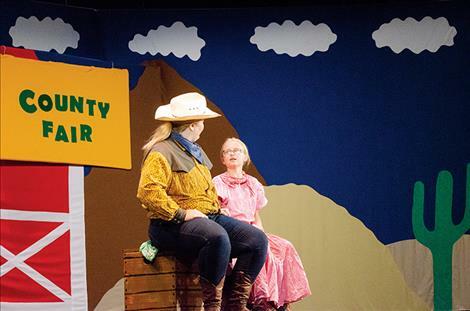 RONAN – A county fair was in full swing as the curtains opened on stage during a production of Beauty Lou and the Country Beast on Friday night. 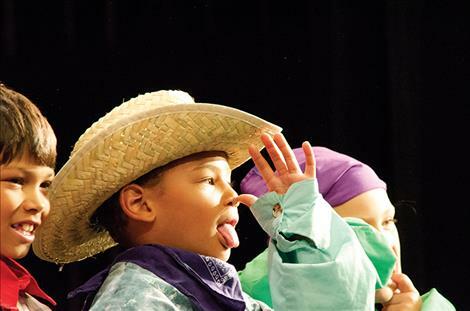 Forty-four club members with the Boys and Girls Club of the Flathead Reservation and Lake County became actors and stage hands with support from the Missoula Children’s Theater. 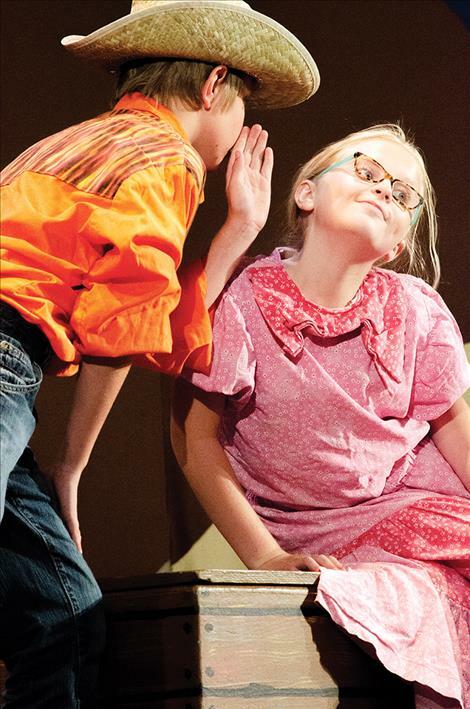 Phoenix Schreckendgust, 11, played the younger version of Beauty Lou in the play (a taller actor took on the role to create the progression of time). 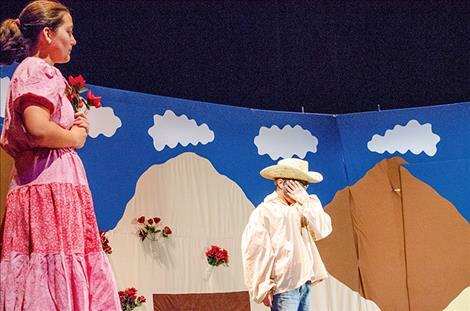 She said the play was about a farmer going to the rodeo to save her farm. The farmer doesn’t win the rodeo and ends up sending her oldest daughter, Beauty Lou, to live with a beast, but the beast turns out to be a good guy. Beauty Lou finds friendship and a garden full of red roses. 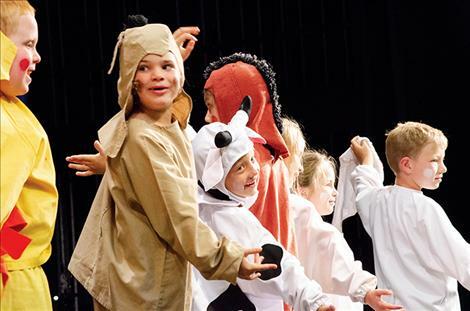 The kids auditioned for the play on Monday, and worked several hours each day to remember their lines. On Friday, they put on an hour long play. “It was exciting,” ShalakSoukup said. She played the older Beauty Lou. 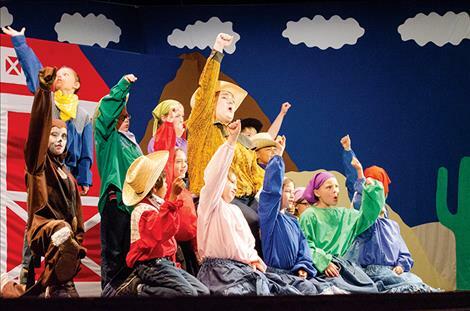 Addison Goodrich was one of four kids helping as a stage director. 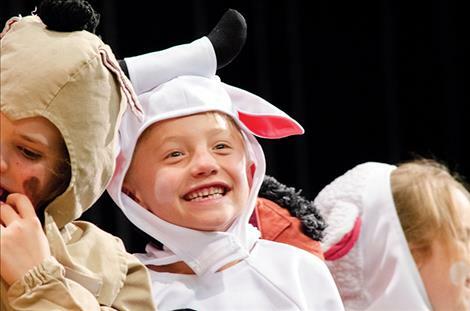 She said it was her job to help the younger children, ages six to nine, as they learned their lines to play the barnyard characters including chickens, pigs and goats. “I was in charge of helping the critters stay on top of it,” she said. Aric Cooksley, the club’s executive director, was impressed at how well the kids did. 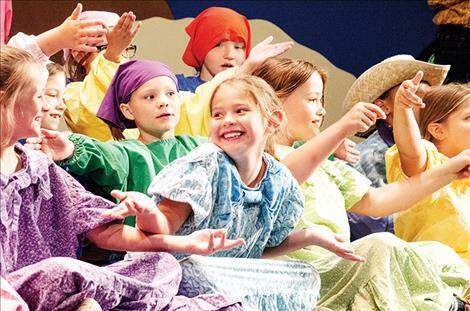 He invited the MCT organization to the club to help the kids experience theater arts. The club provided the funding for the event, and it was free to the public to attend the performance. Donations were collected at the door in the hopes of raising enough funds to bring MCT back again next year. “We want to make this an annual event,” he said. 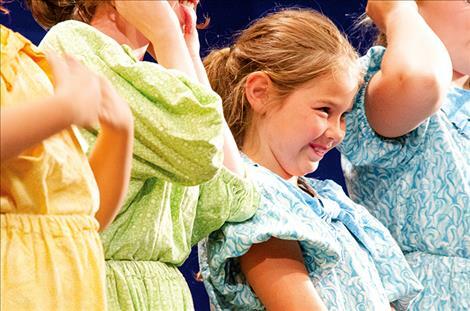 The cast of characters in the play included: Lou Phoenix Schreckendgust as the younger Beauty Lou, and Shalaki Soukup played the older Beauty Lou. Slim was played by Noah Ison, and Dusty was Oliver Mejias. 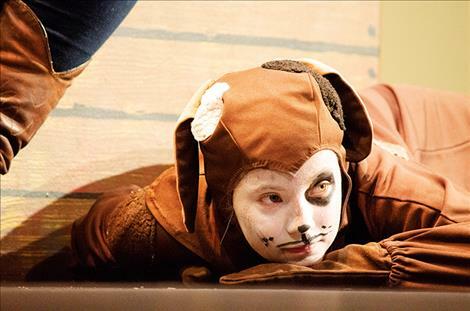 Fleabite Clyde the dog was played by Nissa Rodda. 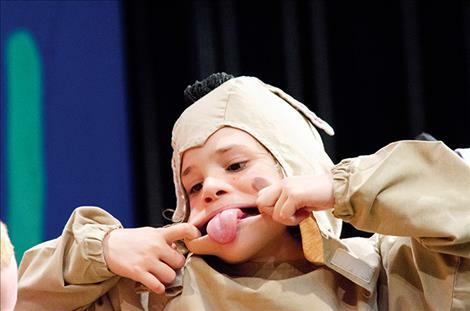 Ethan Buys was on the stage as The Beast and the imaginary friend. 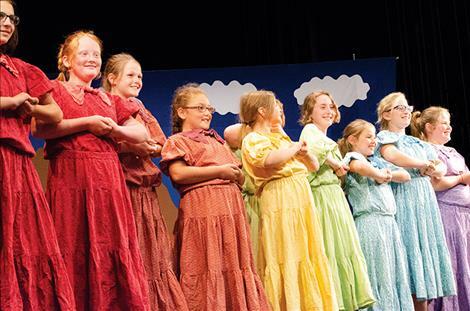 The younger daughters were played by Ashlin Peters, Madeline Peters, Brianna Lapierre, Akaylynn Santschi, Adalyn Hogge and April Urhich. 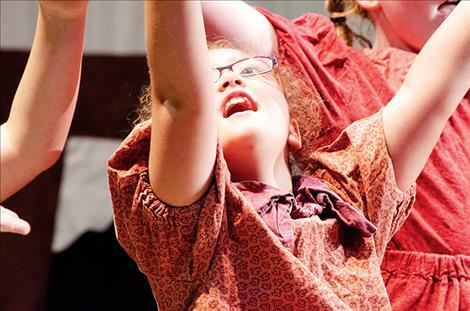 The older daughter were played by Grace-Linn Baltz, Abigail Sorrell, McKenna Corley, Kyri Urhich and Sonia Bell. 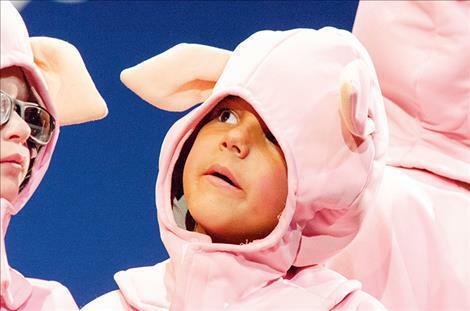 The Barnyard Critters included Elizabeth Mitchell, Forrest Groves, Isabella Dentler, Nehemiah Ison, Janie Mitchell, Millo Rodda, Star Vaughan, Joshawa “JR” Griffin, Bodhin Myers, Johnny Schreckendgust and Eternity Running Rabbit. The assistant directors were Logan Smith, Addison Goodrich, Wyatt Schultz and Garrett Schultz. Phebe Davis was on piano. The MCT actors were Courtney Marks and Julia Bourland. Club staff members helping with the project were Anya Smith and Phebe Davis.